She Dumps Baking Soda In Her Oven. Watch What Happens After She Closes The Door! How often do you clean your oven thoroughly? Honestly, I only do that twice a year using the self-cleaning function of my oven. But every time after I bake something, I will wipe off all the food residues or stains using a damp cloth. It turns out that’s not enough and eventually my oven is covered in gunk. I don’t want to use the harsh store-bought chemical cleaner because it smells bad and is not safe to our health. Luckily there are many tips and tricks out there for cleaning the oven easily and naturally. In this tutorial, YouTube channel EBTV demonstrates a simple cleaning hack on how to clean your oven with just baking soda and water. Baking soda is very versatile and can be used as a natural and effective cleaner for many household purposes. When mixed with a little bit of water, baking soda can be turned into a kind of non-abrasive paste that absorbs odors and oils, which is perfect for scrubbing away the gunk in the oven. 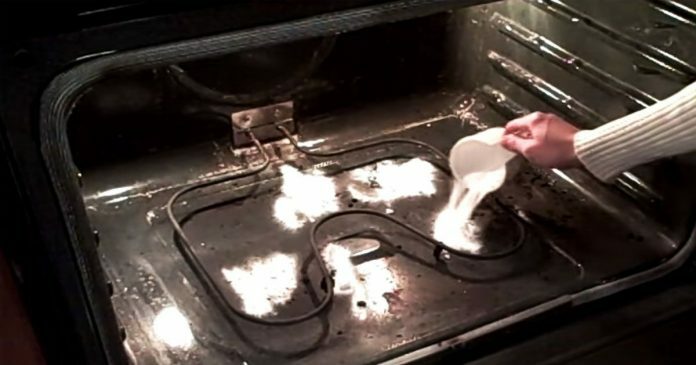 Follow the video and see how easy it is to clean your oven with baking soda and water. Enjoy! Please share this awesome cleaning tip with your friends! Previous articleUsing Glow Sticks, She Makes This Awesome DIY Nightlight For Her Kid’s Room – They Love This! Using Glow Sticks, She Makes This Awesome DIY Nightlight For Her Kid’s Room – They Love This!